Is a fun, entertaining acoustic act covering all types of songs from the 50’s to present day music. 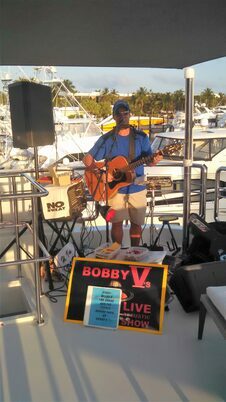 BOBBY IS A WELL KNOWN MUSICIAN IN WESTWERN PENNSYLVANIA, AS WELL AS THE SOUTH FLORIDA AREA, SPLITTING HIS TIME SPENDING WINTERS IN FLORIDA AND SUMMERS IN PITTSBURGH AND NASHVILLE HE HAS BEEN HALED AS ONE OF THE BEST ENTERTAINERS IN THE MUSIC INDUSTRY. AS A SINGER/SONG WRITER HE IS AN ACOUSTIC GUITARIST, AND ALSO PLAYS HARMONICA AND PERCUSSION. HE COVERS OVER 1000 SONGS FROM THE FIFTIES TO PRESENT DAY MUSIC WITH NO BACKING TRACKS, INCLUDING CLASSIC ROCK, SOUTHERN ROCK, MODERN ROCK, LIGHT ROCK, BLUES, FOLK, BLUEGRASS, AND COUNTRY. HE ALSO HAS WRITTEN MORE THAN 200 ORIGINAL SONGS. WHEN NOT PERFORMING SOLO, HE FEATURES SOME OF THE FINEST MUSICIANS IN THE COUNTRY TO JOIN HIM AT HIS SHOWS. HE HAS BEEN A GREAT SUPPORTER OF LOCAL, REGIONAL, AND NATIONAL MUSIC FOR MANY YEARS. WITH HIS GREAT PASSION FOR THE ACOUSTIC GUITAR, HE HAS BEEN PERFORMING PROFESSIONALLY FOR MORE THAN 20 YEARS. WITH HIS LOVE FOR MUSIC, BOBBY HAS MADE A CAREER IN THE MUSIC INDUSTRY. HE IS CURRENTLY WORKING ON HIS NEW CD, WHICH WILL FEATURE SOME OF THE FINEST MUSICIANS IN WESTERN PENNSYLVANIA AND SOUTH FLORIDA.